This week designates the U.S.’s 23rd Equal Pay Day. Equal Pay Day was originated by the National Committee on Pay Equity (NCPE) in 1996 as a public awareness event to illustrate the gap between men’s and women’s wages.1 In the United States, women earn 80 cents per every dollar earned by a man.2 Equal Pay Day is held on April 2, 2019, because it marks just how far into the year, on average, women must work to earn what men earned in the previous calendar year. The gap is closing but there is still a lot of work to be done. Conduct a Compensation Disparities Audit: take an unflinching look at the status quo by collecting data and examining whether gender-based pay disparities exist. Conduct a Salary Evaluation: a process for ensuring the wages you pay are on par with the market. Utilize online salary survey information, such as Glassdoor and Payscale. Conduct a Job Evaluation: Job Evaluation is the process of determining the relative worth of jobs to determine pay structure. Job evaluations can help determine if pay is equitable and fair among your employees. Employers should examine specific job categories. For example, are “Human Resources managers” (who tend to be women) being paid less than “Information Technology managers” (who are predominantly men)? Promote Pay Transparency: In many companies, discussions about compensation in the workplace are stigmatized – or even banned outright. This needs to change. Making salary ranges and compensation packages more transparent can help combat the pay gap and empower employees to negotiate for higher pay. Did you know? It’s illegal to ask for previous salary information in certain places; read Don’t Ask Prior Pay Questions to see if your state is included. The reasons for the pay gap are multifaceted, but these explanations cannot be an excuse for complacency. Women and their families simply cannot afford to wait decades for the wage gap to close. We can close the gender pay gap, boost family incomes, and empower financially-independent women to drive the next chapter of economic growth. 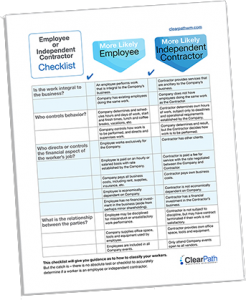 ClearPath can help you accomplish your day-to-day tasks pertaining to your contingent workers. We can help relieve this burden by outsourcing your back office Human Resources and Payroll functions to our Employer of Record service. Contact us to learn more about how our expert personalized service can let you get back to focusing on your business goals. Work with a leader in the industry for outsourced Human Resources and Payroll functions associated with W-2 and 1099 contingent workers. Let ClearPath be the path to your peace of mind. Previous Post: « Banning Smokers – Is It Legal?